Plugin...Recharge! : Finally, a Commercial Charger that Captures the Cord...Thanks GE! Finally, a Commercial Charger that Captures the Cord...Thanks GE! 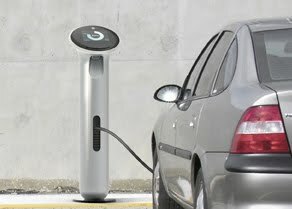 Today, one of the oldest companies in the world jumped into one of the newest "industries" - General Electric formally announced a commercial EVSE...The WattStation. GE partnered with Plug Smart (a.k.a. Juice Technologies) for the charger's "Smart Grid" intelligence. The product is beautiful...it looks like it was designed by some ultra-creative, swiss guy...and it was! His name is Yves Behar and his firm has designed several innovative products (see video below). Although the design is unique and looks very functional, the best part is that it captures and stores the cord in it's base. No other EVSE on the market that I know of does this...but every EVSE manufacturer I've talked to recognizes cord management to be significant issue. Long: up to 25 feet (7.62 m) long by NEC Standards. Most I've seen are about 15-18ft. Heavy: the diameter of the cord is about 1/2 inches (12.7 mm) - you could tow a boat with these! Dirty: after dragging the cord around your car a few times, the cord will not be something you want to touch. After reliability, the biggest challenge to using an automated reel system to store the cord is how to address a twisted cable. If the user stores the J1772 connector into it's holster and tries to retract the cord, it would be nearly impossible for the mechanism to retract the twisted cord. GE's approach to cord management is a vertical reel which pulls in the cord after use. This seems like a good plan since the reel is visible and minor cord tangling issues can be fixed by the user or "host" of the charging station. Anyway, I'm surprised and impressed that one of the oldest electrical supply companies in the world came up with a design so functional and elegant. I'm looking forward to getting my hands on a production version soon.